It cannot be denied that Karnataka was once a major political centre during the reign of the Vijayanagara Empire. Even though it was known as the State of Mysore, the rich land of Karnataka has always contributed to the development and sophistication of its empire during the ancient and medieval period. Today, the historical sites dotting the plains and hilly regions of Karnataka certainly prove it. If you are an avid traveller and love exploring the yesteryears of any nation, then you have reached the right article. Read all about must-visit historical places in Karnataka to learn the history of India. Currently located in the Mandya district of Karnataka, Srirangapatna was the capital of Mysore under the rule of Tipu Sultan. Prospering through several battles and wars, the epic history of Srirangapatna can be figured out in the lawns of its historical buildings, which are still narrating the past of the state. The major attractions here include Sri Ranganathaswamy Temple, Daria Daulat Bagh, Tipu's Tomb, etc. Being a UNESCO World Heritage Site, Hampi showcases the legendary years of Indian history during the Vijayanagara Empire. Even though the ruins at Hampi are no more aesthetic, they still attract millions of tourists from all over the world who come to scrutinise its architectural masterpieces and try to measure its greatness through these ruins. If you one amongst these explorers and love to dive deep down the history, then Hampi is an ideal destination for you. Also known as the Cultural Capital of Karnataka, Mysuru is one of the most visited places in South India on account of its royal palaces and surreal gardens. The major tourist attraction in Mysuru includes Mysore Palace. Even though it is impossible to fathom the great work of artistry on its palaces and other buildings, you can find innumerable tourists and historians all around these ancient architectures trying to understand the glorious past of the country through its historical artefacts. Located in the Hassan district of Karnataka, Halebidu has become a significant place for history lovers over a period of time. If you are looking to witness the best of Hoysala architecture in the form of decorated temples, then Halebidu is the perfect destination for you. Apart from visiting its temples, you can also pay your respects to Parshvanatha Basadi and Shantinatha Basadi, which are important religious sites in Jainism. When you have so much to explore in Halebidu, then why not plan an exciting trip to this wonderful town? What can be better than visiting complexes that best portray the secularity in the nation? If you are looking forward to learning about the evolutions of religions other than Hinduism, then Pattadakal is your destination. It is generally a historical site where you can find numerous Hindu and Jain temples located adjacent to each other. Under the management of the Archaeological Survey Of India, Pattadakal is an ultimate place to read about the times of India, including its prehistoric era. Bidar is one of the least-popular historical places in India and has its roots buried deep down the history of human beings. Several mentions of this place are also found in the epic Mahabharata. With numerous monuments and tombs, Bidar is also known as the City of Whispering Monuments and has become a hub for historians since the last few years. How about exploring Bidar and its historical compounds? Badami is well known amongst tourists for its cave temples, which have been standing strong since the time of the Chalukyas. The best of rock-cut art forms can be seen in this historical town of Badami. Once you are inside the compound of Badami, you will definitely be surprised after witnessing the cave temples cut out of gigantic rocks. 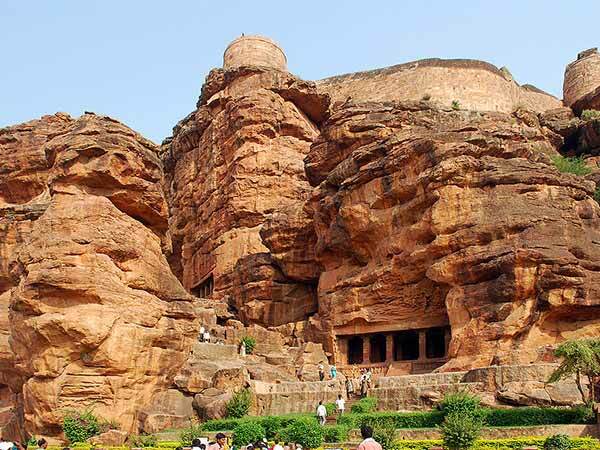 If you have never been to any monumental cave temples, then start your journey at Badami.